4% increase for a 2-year lease renewal. $40 increase for a 2-year lease renewal. 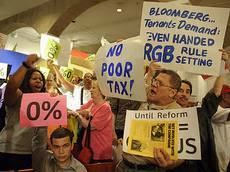 The Rent Guidelines Board (RGB) has imposed this "poor tax" so that tenants whose rents are below $1000 - usually older tenants who've been in their homes longer will pay higher increases. The proposal, which passed by a 5-4 vote, raises rents on one-year leases by 2 percent or $20 and on two-year leases by 4 percent or $40. Individual raises in rent depends on whichever number is greater. The increase impacts releases signed or renewed starting in October. The approved increases were on the low end of proposed increases, which extended as high as 4 percent for one-year leases and 6.75 percent for two-year leases. According to studies conducted by the Rent Guidelines Board, the majority of rent-stabilized tenants cannot afford their apartments. The same studies showed that the cost to operate a rent-stabilized apartment building went up by 2.8 percent in 2012." Now Albany has to reform the RGB with S741/A6394 - and enact the rest of our Legislative Program!